NEWPORT NEWS, Va., Nov. 16, 2006 (PRIMEZONE) -- Northrop Grumman Corporation (NYSE:NOC) has been awarded a planning contract from the U.S. Navy valued at $558 million for the refueling and complex overhaul of the nuclear-powered aircraft carrier USS Theodore Roosevelt (CVN 71). The company's Newport News sector will perform the work, which includes planning, design, documentation, engineering, material procurement, shipboard inspections, fabrication and preliminary shipyard or support facility work. 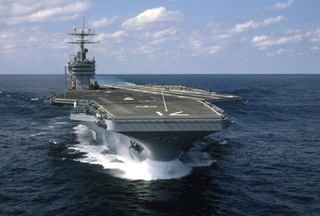 The carrier is scheduled to arrive at the Newport News shipyard in 2009 for its first and only refueling during a service life expected to span approximately 50 years. "Planning and pre-arrival preparations for a project of this magnitude are critically important to the success of the overall effort," said Ken Mahler, vice president of aircraft carrier overhaul programs for Northrop Grumman's Newport News sector. "A highly-skilled and talented team from Newport News will partner with the Navy over the next three years to set the stage for the successful accomplishment of this significant and very complex program." Launched in 1984 and delivered to the Navy in 1986, the USS Theodore Roosevelt is the fourth Nimitz-class carrier built by Northrop Grumman Newport News, the nation's sole designer, builder and refueler of nuclear-powered aircraft carriers. It will also be the fourth ship of the class to undergo this major life-cycle milestone. More than 1,300 employees will support the planning effort. The USS Theodore Roosevelt (CVN 71) was built by Northrop Grumman's Newport News sector and is pictured during its initial sea trials in 1986.